An Italian roast pork dish traditionally made by slow roasting a suckling pig stuffed with ingredients and basting it with olive oil during the cooking process to keep it moist. In addition, the Porchetta may be rubbed with garlic or a marinade while it cooks over an open fire, on a spit, or roasted in some similar fashion. The meat is then cut from the hog to be individually served with bread or other foods. Typically, the key to good Porchetta is the method of prepartion, such as slow roasting and/or basting as well as the ingredients used to provide a rich tasting pork, which include the spices and seasonings. When prepared whole, the pig is stuffed with a variety of herbs such as rosemary, thyme, and sage mixed with garlic and onions, and seasoned with spices such as coriander, nutmeg, fennel seeds, pepper, and cloves. Roasting the whole pig requires time and larger numbers of people to consume the pork, so many Porchetta recipes do not require an entire pig. Other versions of this Italian dish use the meat from a pork belly or pork shoulder, removing the bones but in some instances leaving the skin, and then roasting the meat in smaller portions. Some variations tie two fully seasoned pieces of pork together with some seasonings stuffed between the pieces. Precooked versions of Porchetta are also available which use the meat like a luncheon meat, sliced thinly to be laid on breads or for use with appetizers. 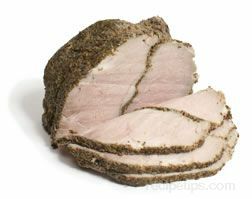 The meat is well seasoned and salty in flavor providing a rich tasting pork meat. In addition, an American version of Italian porchetta is at times referred to as porkchetta, porkcetta, or porketta, which is a slow cooked pork roast flavored with a variety of seasonings. Attributed to Italian families who migrated to the U.S., this pork dish is made with a boneless pork loin seasoned with a dry rub and for some recipes, wrapped with pancetta. Typically, the ingredients of the dry rub include dill seed, fennel seed, oregano, pepper, garlic, and other seasonings.